As the clock ticks on the mere thought of an emergency financial manager, five council members reiterated that they are not ready to give up on their city or their jobs as public servants. 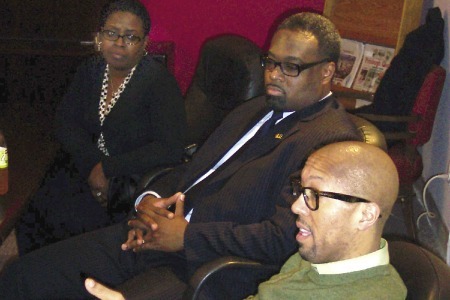 The members, Ken Cockrel Jr., Saunteel Jenkins, James Tate, Andre Spivey and President Charles Pugh came before the editorial board of the Michigan Chronicle to stress how they are tired of being painted as obstructionists. It’s no secret by now that last week Gov. Rick Snyder signed a new emergency manager law that will take effect in the spring. The law will give emergency managers the authority to alter or get rid of collective-bargaining agreements altogether. The most controversial provisions of the previous such law, Public Act 4, was revoked by voters in November. Snyder has selected a six-member review team to go over Detroit’s books, a huge legal step that will likely see the appointment of an emergency financial manager. The team will have 60 days to complete their review, although the state said Snyder has asked them to accelerate the process. Each council member, particularly Pugh, talked about how they have been working diligently with Mayor Dave Bing and his administration on how they can avoid a fiscal cliff of their own. Pugh talked about how the city is at a watershed moment and the need to make tough decisions in the midst of a crisis. He and the other council members also talked about how they are frustrated with the way they have been often portrayed to the public through the lens of the media, considering Detroit has been going through serious changes for some 50 years now. Many have blamed Detroit’s troubles on White flight and deindustrialization, but there is more to it than that. When other cities were expanding, Detroit was contracting. For example, in 1950 Houston was roughly the same size as Detroit — it was 160 square miles, Detroit is 139. Yet today Houston is 600 square miles because as their surroundings grew, so did the city, therefore the tax base stayed. And while people moved to the suburbs, to cities such as Southfield and Farmington Hills, so went the city revenues. As a result, Detroit has created a city income tax, high property tax rates, a utility tax and hundreds of millions of dollars of debt due to what it borrowed to meet current obligations. Unfortunately, the city now has a crisis that has become a serious cancer. “The reason that we are here is because we realize — me being a former journalist — is we need to do a better job of getting our message across,” said Pugh. “We realize that we may be one step away from an emergency manager. The members, Ken Cockrel Jr., Saunteel Jenkins, James Tate, Andre Spivey and Pugh, said they have sent a plan to state Treasurer Andy Dillon, with the hope that Snyder will not appoint an emergency financial manager. The Treasurer’s Office confirmed through a spokesman that they have received the council’s plan, yet it has not been reviewed. The council members agreed that any plan must look at how they improve public safety and other city services.